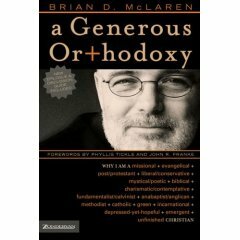 A Generous Orthodoxy is perhaps one of the most controversial books written by an evangelical author in the last couple of years. I have read countless blogs and magazine articles which criticize this book from almost every angle possible. When a friend of mine in her 60's asked me some questions about it, I realized that I probably should also read the book. So, over the past couple of weeks, that is what I have been doing. When I have mentioned this to my friends I have received comments ranging from "what a piece of drivel -- can't McLaren stand up for anything" to "what a wonderful book -- I just love it -- my small group is studying it right now." So, what do I think of the book? Well, while I don't think it is inerrant, or has been written as if dictated by the hand of God, I must admit that I love the book.There are a couple of things that make me go "hmmmm" -- but not in a bad way -- in a way that says I need to think about this more. In all the critiques I have heard on A Generous Orthodoxy, there have been two things that have been talked about the most -- McLaren's ideas about salvation and the question of Christianity's relationship with other religions. I'd like to say a few words about both of these issues. I love what McLaren has to say about Jesus as Saviour.
. . . in Jesus, God is intervening as Saviour. . . by judging (naming evil as evil), forgiving (breaking the vicious cycle of cause and effect, making reconcilliation possible), and teaching (shwoing how to set chain reactions of good in motion). Jesus comes then not to condemn (to bring consequences we deserve) but to save by shing the light on our evil, by naming our evil as evil so we can repent and escape the chain of bad actions and bad consequences through forgiveness, and so we can learn from Jesus the master-teacher to live more wisely in the future. (page 96). Isn't this a great definition of salvation? But, this is probably not the controversial issue in regard to salvation. A couple of pages later McLaren syas that he used to believe that Jesus' primary focus was on saving me as an individual and saving other "me's" as individuals. This is of course the whole idea of Jesus as personal saviour. He still believes that Jesus is vitally interested in saving individuals, but McLaren also talks about the idea of Jesus saving the world -- not the idea of universalism, but rather the idea that God is saving us -- so we can be about the establishment of the kingdom of God. In a self-centered and hell-centered salvation, doesn't Jesus -- like every company and political party -- appeal to me on the basis of self-interest so that I can have it all eternally and can do so cheaply, conveniently, easily and quickly? He continues to talk about the fact that if we see salvation as primarily a personal issue, having Jesus as your personal saviour can actually make you more self-centered and less concerned about justice on earth.
. . . although I believe in Jesus as my personal saviour, I am not a Christian for that reason. I am a Christian because I believe that Jesus is the Saviour of the whole world. The more I thought about all of this, the more it made sense to me. America has 400,000 churches -- yet Christianity is increasingly become more of a ghetto within American culture rather than a force for positive change. We are planting churches all the time -- often filled with people for whom Jesus is their personal saviour -- yet Jesus seems to make little or no difference in their lives, family or community. Evangelicals have a divorce rate as high or higher than that of the rest of the country. It is hard to find anyone -- religious or not -- that believes that the moral, ethical and social climate in this country is improving. Yet, 400,000 churches and 40% of the population attends church. Why is there no change? Why are all these churches we are planting not making a difference in our culture? A friend of mine who has worked in SE Asia for the last 10 years believes that perhaps here in North America we have become so concerned about people accepting Jesus as their personal saviour, that we have not seen the whole Gospel. We are planting "harvest" churches -- but not healthy and holistic churches -- churches that understand that the Gospel is not just about seeing people saved -- but also about discipling people (helping people love like Jesus and live like Jesus) and discipling nations (seeing communities transformed by the grace of God). So, instead of planting churches that engage and become part of our communities -- adding value to their communities -- doing what is good for their community, we plant churches that are concerned about personal salvation -- we plant churches for consumers of religious goods and services -- that they add on to the other goods and services they feel are important for leading a life as close as possible to the "american dream". Something to think about -- don't you agree? Maybe McLaren is on to something here. In the chapter on incarnation, McLaren talks about the relationship of Christ with other religions. The controversy surrounds paragraphs such as the following ones from pages 249 and 250.
. . . we are linked and bound through Christ's incarnation all people. I am not saying that all religions are the same, it doesn't matter what you believe, truth is relative . . . I am saying that because we follow Jesus, because we believe Jesus is true, and because Jesus moves toward all people in live and kindness and grace, we do the same. Because I follow Jesus, then, I am bound to Jews, Muslims, Buddhists, Hindus, agnostics, atheists, New Agers, everyone. . . . Not only am I bound to them in love, but I am also actually called to, in some real sense . . . become one of them, to enter their world and be with them in it. Radical statement don't you think? McLaren goes on to say that the real enemy is not fundamentalist Islam, but the "McDonaldization and Wal-Martization of the world". The enemy of all people of faith is global consumerism and lust for personal items that make our lives better. I suspect most of us American evangelicals don't see consumerism as the greatest threat to our faith -- but my sneaking suspicion is that McLaren and Jesus are on the same side on this issue. What does this mean practically? McLaren suggests a number of things. The Christian Faith should become a welcome friend to other religions, not an enemy. We should be a protector of the heritages of other religions and a defender against common enemies. If we are truly to love our neighbour, then we should also be willing to learn from the good that is in our neighbours religion. We must accept the coexistence of different faiths in our world -- willingly, not begrudgingly. We should actually talk with people of other faiths, engaging in humble gentle and respectful dialogue. We should not stereotype people of other religious beliefs. Conversation with other religious faiths does not exclude evangelism, but makes it possible. We must be aware that our "old old story" is not necessarily the true story. In other words, we must be open to the idea that our understanding of the Gospel -- as it was passed down to us by our forefathers -- may have elements of untruth in it. If members of other religions are under threat, we must seek to protect them. As a . . . Christian, I consider myself not above Buddhists and Muslims and others, but below them as a servant. Better, I consider myself with them as a neighbor and brother (page 263). To be a Christian . . . is not to claim to have truth captured, stuffed, and mounted on the wall. It is rather to be in a loving (ethical) community of people who are seeking the truth (doctrine) on the road of mission (witness) and who have been launched on the quest by Jesus, who, with us, guides us still. Do we have it? Have we taken hold of it? Not fully, not yet, of course not. But we keep seeking. We're finding enough to keep us going. But we're not finished. That, to me is, orthodoxy -- a way of seeing and seeking, a way of living, a way of thinking and loving and learning that helps what we believe become more true over time, more resonant with the infinite glory that is God. My response to that is simple -- AMEN! my response to this is simple as well- "hogwash!" karl, are you really saying the enemy of all people is global consumerism and lust, not the ism's of the world? gosh, silly me - i thought the enemy of the people of the world was the devil- who influenced through lust, consumerism and islam, buddism, hinduism, etc. perhaps this was a "untruth" told to me by Paul and other father's of the faith who were wrongly influenced by their cultural mindsets. yes, emp. on personal salvation in the seeker church does have an element of "me-centeredness" but that doesn't mean that Jesus doesn't reveal himself to people on a personal basis as well as communally. count me as one who is not passive nor enthusiastic about this book. Loving greetings in the sweet name of Our Lord and Savior Jesus Christ. Almighty God gave me a vision also in that vision I saw Lord Jesus Crucifixion scene it made me to serve Him. Came to Christ and am working among them for the glory of God. God gave me the calling and vision to do His work full time. visiting sick people also doing internet evangelism , by His grace traveling around the world doing missionary work. I am also running a regd Charitable Trust to help many and planting churches to the unreached areas. Kindly pray for us and support us if God speak to you. Heb 4:12.For the word of God is quick, and powerful, and sharper than any two-edged sword, piercing even to the dividing asunder of soul and spirit, and of the joints and marrow, and is a discerner of the thoughts and intents of the heart. Kindly pray for our ministries and us.